The Haile Plantation Community is located in SW Gainesville. This master planned community began in the late 70’s and has evolved into a peaceful & attractive area where residents have miles of trails for biking, walking and jogging. Residents enjoy the award winning neighborhood center at Haile Village and Haile Market Square. Here you can search for homes for sale in the Haile Plantation community. Currently there are over 2,700 custom homes, town homes and condominiums in different areas throughout Haile Plantation. Each area has its own name. You will enjoy road, sidewalks & trails within the community. Over 1,000 acres of hardwoods & forest. Plenty of shops and restaurants for your lifestyle too. 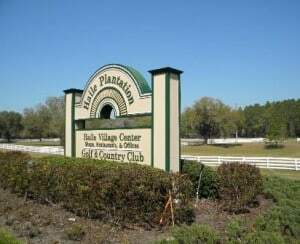 The Haile Plantation Golf & Country Club is a private 18 hole golf course and a clay court tennis facility are located within Haile Plantation. Various memberships plans are available. Historical information about the Haile Family plantation dates back to 1854. View the Google Map of Haile Plantation.